Chennai boasts of some of the best schools in the county and it is no different when it comes to the CBSE curriculum. There are numerous schools mushrooming in the city every year. 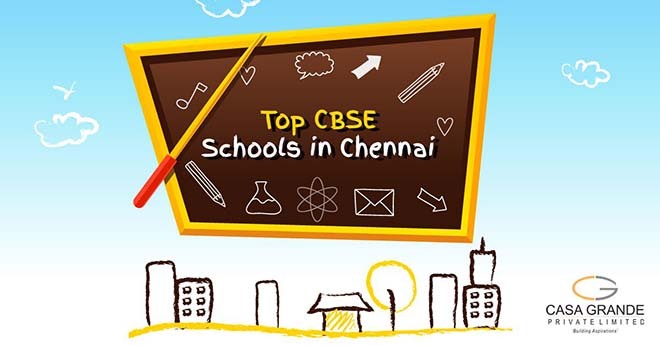 So if you are confused about which school you should put your child in, following is a list of top ranked CBSE schools in Chennai, in no particular order. Founded by Chettinad Meena Muthiah in 1986, the school is located in RA Puram. The school is one of the biggest schools in Chennai, with about 800 faculty members and around 10,000 students. The school focuses not only on education but also extracurricular activities and has facilities such as state-of-the-art swimming pool and a well equipped library. The school is run by the Citizens Education Society and was founded in 1970 by Dr. K.P. Gopalkrishna and is affiliated to the CBSE. One of the most reputed schools in Chennai, NPS inculcates high standards of education to all its students. Located in Anna Nagar, SBOA is one of the advanced schools in the city. With features like classrooms with plasma TVs & smart boards, free coaching class for students who need attention, seminars, guest lectures and night study, the school ensures its students have the best of facilities and learning environment. They also have an athletic ground, mini swimming pool for kindergarten students and football ground. KendriyaVidyalaya IIT was started in 1964 with the patronage and assistance of the IIT Management. Situated in the calm and lush green IIT campus, this school has been nurtured by the parental care of the IIT Authorities and is one of the best schools in the city today. The school has the best physical facilities and the fantastic maintenance thanks to IIT Madras. The school was founded in 1958 with just 13 students in a shed on the terrace of the residence of the Dean & Director, Dr. Y.G. Parthasarathy. From such humble beginnings, PSBB School has now grown to one of the top schools in the city with three branches, more than 8000 students and around 500 staff members. PSBB is the top choice for parents who want both education and aesthetic values. One of the most reputed schools in the city, Vidya Mandir was established in 1956. The school began as a Ladies Club with just a handful of students. Today the school has more than 2000 students, 100 teachers and 35 support staff. Pon Vidyashram is a school in Valasaravakkam, with branches at Velachery, Injambakkam and Kolapakkam in Chennai. The school focuses on advanced learning and providing students with the best learning environment. Situated in Mylapore, the school has a reputation of producing some of the brightest minds in the city. Most students graduating enter higher education institutions such as Indian Institutes of Technology, Birla Institute of Technology and Science, NIT Tiruchi, National University of Singapore and Anna University. Founded in 1978, the school is located in Adyar and provides value based education with a view to develop the mind and personality of each child and to inculcate the qualities of leadership. The school also has co-curricular activities and other programs are designed for a best intellectual growth and overall development of the child. Maharishi Vidya Mandir is a chain of schools across India and has three branches in Chennai. Being part of a chain, the school provides high quality education to the students. They have braches in Chetpet, Sriperambadur and one near Mahindra City. The branch in Sriperambadur also has boarding facilities. The school was founded in June 2000 and has more than 1200 students with about 70 members of faculty and staff operating at two campuses. The Park Road, Anna Nagar campus caters exclusively to kindergarten children and the Maduravoyal campus admits students from Preschool through class 12. The school does not focus just on education but a place where conscious and positive effort is made to develop fully all the faculties of the child who is trying at every stage to discover and cultivate special talents in the child and to strengthen the areas in which the child is weak. Sri Sankara Senior Secondary School is located in Adyar, amidst the peaceful surroundings near the Theosophical Society. Apart from imparting high standards of education, the school also offers coaching for yoga, karate, violin and cricket. Chinmaya Vidyalayas are a group of schools operated by the Central Chinmaya Mission Trust (CCMT), founded by a spiritual leader late Swami Chinmayananda and currently headed by Swami Tejomayananda. They have branches across India and are located in three places: Kilpauk, Anna Nagar and Virugambakkam. Do you think we have missed out any school? Leave a comment and let us know.